These 2 professionals were excellent! And what cute kids to paint on! Mr. Robert had them entertained for almost an hour straight. He was GOOD! This is what Mr. Robert caused in a huge group of kids. Nothing better than seeing kids laughing. One of our Face Painting Pro's! The birthday boy's sweet sister had a blast too! More Abracadabra Extravaganza Balloon Sculptures successfully adopted by a loving family. Home is where the party is! Race Cars, T-Rex & More! We do what we can to make everyone Happy! 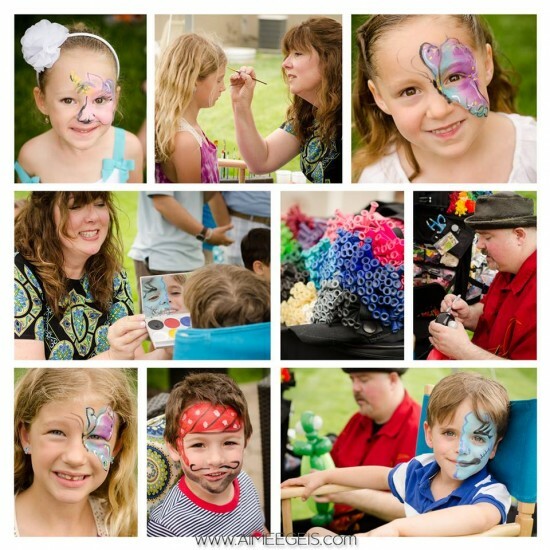 Offering Fantastic Magic Shows, Live Animals, Balloon Sculpting, Face Painting, Caricatures, Juggling, Bounce Houses & More! Be it a small private party, festival, birthday, or an enormous state fair, we’ve performed for private, public, & corporate events across the USA. We have years of specialized training & experience in creating a great time! 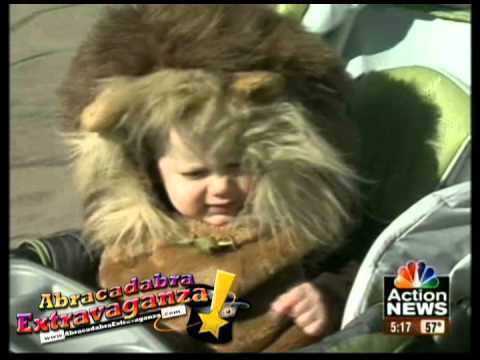 You have the guests, we have the fun: Abracadabra Extravaganza! 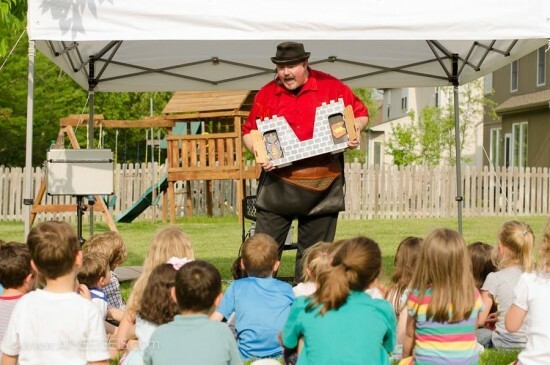 Contact us & bring one of Kansas City‘s best magic shows to your event. Great Wit and True Talent! We hired Robert's Abracadabra Extravaganza for our store's First Anniversary Party to perform a magic show and twist balloons for our guests. Robert and Valerie were wonderfully interactive with the kids, put on a GREAT magic show, and can twist those balloons into any shape you can come up with! My staff and I basically laughed for four hours straight, and our customers had a fabulous time. I highly recommend Robert and Valerie and would definitely hire them again! We had a wonderful time at the anniversary celebration of Readers World bookstore - such great staff & fantastic customers who were all willing to play! I would definitely hire AE again. Robert was awesome with the kids and did great work. Such a fun party, wonderful family & the twins were adorable! Thanks again! I contacted Robert about having a balloon twister at my daughter's birthday party that was only 2 days away. He was booked for that date and time, but he called around to his associates for me. They were all booked, not surprisingly, so Robert rearranged his schedule to be able to make it to the party. He arrived on time, did a great job making balloon creations and even made a couple of extra special characters for the birthday girl! He was silly with the kids and they loved him! It was a pleasure to provide such fun for your daughter's birthday. I am happy we were able to rework our booking schedule to accommodate the day of your event. Thanks again & we love the photos from the party! ~ With Add-On packages that can include professional Balloon Artists, Face-Painters, Caricature Artists, Bounce Houses, & More! As close as you can get to having "Professional Fun People,” we excel in providing Top Quality Magic just for you! Be it a small private party, festival, birthday, or an enormous state fair, we’ve performed for private, public, & corporate events across the USA. We have years of specialized training & experience in creating a great time. ~Close-Up (Strolling) Entertainment - Great mobile Entertainment for parties & events! ~Stadium (Huge Arena floors) Entertainment - Great for massive audiences.